I have been in Haiti since the end of January 2010 working as the Program Manager for Safer Construction and Disaster Risk Reduction in Port-au-Prince. I came out here with another international NGO as a shelter coordinator, but after their initial distribution of emergency shelter they switched focus to WASH – NGO parlance for water and sanitation health – and job creation for people affected by the earthquake. So, I joined Save the Children at the end of April – the children’s charity I worked for in Aceh, Indonesia following the Indian Ocean tsunami in 2004/5. Our safer construction team in Haiti’s capital Port-au-Prince consists of six engineers, an assistant and me. Since April we have been strengthening temporary schools, building child friendly spaces and health clinics. Recently our focus has been on constructing cholera treatment units – CTUs. In total we have built four CTUs in partnership with Save the Children’s health and WASH teams. It is my first experience of working in a cholera epidemic, which has so far claimed the lives of 3,600 people in Haiti. But what surprised me most is how incredibly easy it is to prevent and treat cholera – simple rehydration solutions will reverse the devastating effects of cholera on the body within one to three days. Obviously the earlier someone gets access to rehydration treatment the quicker they can make a full and speedy recovery. I remember the first cholera case we had at our cholera treatment unit based at a place called Gaston Margron, where approximately 6,000 people are living in tent camps. It was a nine-year old boy. He was very sick when he arrived, but the next day he sat up looking for something to do – healthy again with the aid of an IV drip and rehydration! In Haiti safer construction was originally simply called reconstruction. But we wanted to emphasise that Haiti had to build back safer and better. Already we are planning to build ten transitional schools in Port-au-Prince as well as more in Leogane and Jacmel. We hope these schools will act as a model of safer construction methodologies that will be replicated in shelters and other construction projects in the neighbouring communities. I’m also involved in managing the final stages of a tender process to appoint a local building contractor to construct schools in all three locations. It has taken time to get to this stage since we had to get our school design approved by the Haitian Ministry of Education. I am looking forward to getting contractors finalised and the start of school construction. It has been an arduous process, and I feel very sorry for the children studying in tent schools. We also have to ensure the school authorities own the land where we plan to build – a crucial factor since we don’t want to end up in the awful predicament of having to tear down a school because of contested land ownership. And that’s a potential problem here in Haiti since pre-earthquake many of the schools were on rented land. There are other problems too. 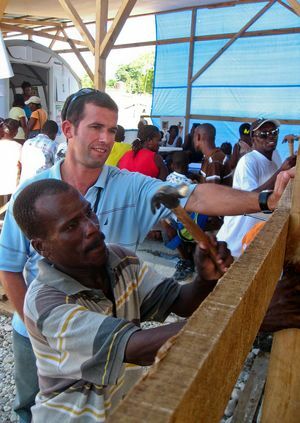 There is limited capacity and skills for construction in Haiti. So, whilst we are completing construction projects we have to build the capacity of local tradesman, and monitor their progress carefully to ensure the highest possible building standards. Port-au-Prince is not a large city, but because of poor road conditions and traffic it can take at least two hours to get to some of our sites. This limits what is possible to achieve each day. Also, most quality construction materials like timber have to be imported from places like the Dominican Republic, which takes time to arrive in country and clear customs. As a result of the cholera outbreak as well as election violence late last year it has been difficult to undertake ‘normal’ activities. Before signing off I must mention how amazed I am by the resilience and good humour of the Haitian people. They have been through so much in the last year, and yet they always have time and a smile for you. They deserve a break and some luck in 2011. Learn more about our recovery response to the earthquake in Haiti. Help Us Respond to the Haiti Earthquake Recovery. Please Donate Now. I’ve been working in Haiti since April and I’ve seen quite a bit of progress, especially over the past few months. But first before I share with you what we’ve doing to help Haiti’s children, let’s take a moment to reflect on the events of January 12, 2010. As most people know at least 230,000 people died in the earthquake in a country that was tremendously poor even before the disaster. Indeed before the quake only about a third of Haiti’s population had access to safe drinking water, and half of Haiti’s children weren’t in school. The quake occurred here in Port-au-Prince – Haiti’s capital – the nerve centre of the heavily centralized country. 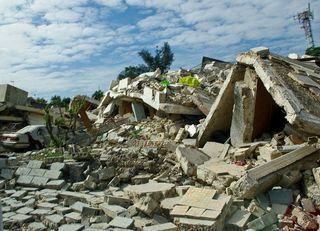 Not only did the earthquake impact people in Port-au-Prince but also in places like Leogane, and along the south coast. Much of Haiti’s essential infrastructure was damaged, but I was especially shocked to learn that 4,000 schools were destroyed. It was a catastrophic event. A three-story building reduced to rubble. Save the Children immediately responded to the earthquake. Because we’ve had a presence in Haiti for over thirty years we were able to mobilize staff both here and from around the world to mount one of the largest humanitarian responses in the agency’s 91-year history. Following the disaster, Save the Children focused on child protection, health, education, and livelihoods. We expanded our programs, and began work in Léogâne, as well as Jacmel, which is located along the southern coast where we had not previously operated. 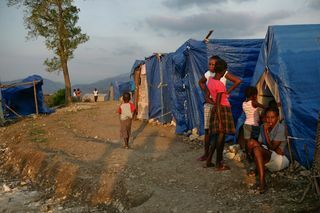 Until recently there were 1.3 million people, about sixteen per cent of Haitians, living in tents. When I say tents we’re really speaking of plastic sheets and poles. These are not tents that people would take camping anywhere in the world. These are tents that are more like kite plastic held up by a few wooden poles. To believe it you really have to see the situation in which people are living. It is a standard below what I would say is sub-human. Residents outside their tents at the Camp de Fraternite shelter camp. During a strong hurricane there is absolutely no way that these plastic sheets and poles will withstand the wind and rain. Beyond that another 500,000 people relocated to live with family and friends in rural areas. They’re part of the hidden earthquake-affected population that are not visible. They place a huge burden on their families in the rural areas who already had a hard time feeding themselves before the earthquake. Now these families have permanent houseguests who didn’t just come for a meal or a visit, but for the unforeseeable future. The challenges that we face are multiple. The government, which was not strong before the earthquake, was further weakened since the disaster took the lives of many government workers as well as destroyed much of the existing infrastructure. Although NGOs have some successful partnerships with the government, more often than not the NGOs themselves either provide the service like, say, a health service, or it does not exist. All of us would certainly prefer that this was not the case, but this our reality. 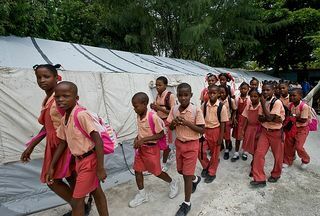 An example of that would be the fact that 80 per cent of the schools are privately owned in Haiti. These are not private schools like in Europe, the United States, Canada or Australia. These are schools whose owners operate them in the community as a service or small business. Many of these schools were destroyed last January, and many of the families whose children attended these schools can no longer afford the annual school fees of a few hundred dollars. As a result too many children are missing out on the chance of an education. But when our team and I talk to Haitians, education is always the highest priority. It’s where they want to invest in their children’s future. It’s critical to them that these private schools open as soon as possible. That’s why in 2011 Save the Children will partner with 154 schools through teacher training and resource materials, enabling 45,000 children to get an education. Students file into a Save the Children school in Port-au-Prince. On top of the quake in late October cholera came to Haiti starting in the Central Plateau, and has now expanded throughout the country. As of today, there have been 3,600 deaths as well as over 150,000 confirmed cholera cases. But these are just the reported cases. Many people living in rural areas don’t have access to cholera treatment centres, where literally within one to three days a person who has cholera can walk out healthy. The tragedy though is that we can save lives from cholera, but then people walk back into the conditions which are breeding grounds for the potentially deadly bacteria – dirty water, poor sanitation, and crowded conditions – all of which contribute to the rapid spread of cholera, and if left unchecked, can be deadly, especially to young children. 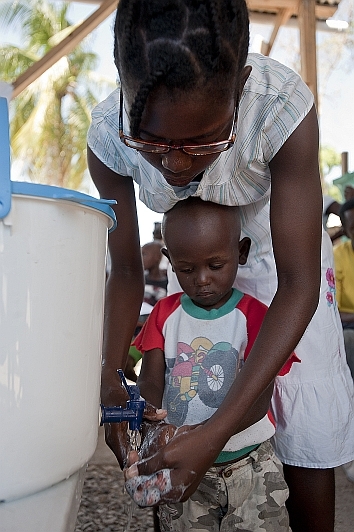 Will, 3-years-old, washes his hands at a Save the Children health clinic. Nevertheless Save the Children is saving lives through our ten – soon to be sixteen – cholera treatment units, and also through our water and sanitation community outreach programs where we promote safe hand washing, and basic sanitation practices. While these are simple practices we need to reinforce the messages and repeat them over and over, while also addressing basic sanitation issues. However, in a country where only half the people have completed fifth grade, it’s a challenge to get our message out about safe sanitation practices. One year since the earthquake we understand why some people would be disappointed with the slow pace of recovery in Haiti, and why things are not better. All of us working here would very much like to accomplish more. But it’s important to remember that things were bad in Haiti – the Western Hemisphere’s poorest nation – long before the quake. Nevertheless we see progress. 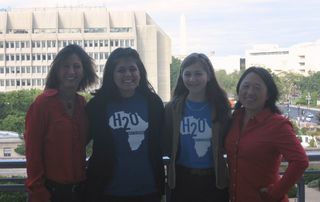 These past weeks I have visited programs together with some of our Save the Children supporters from around the world. I was in Leogane – the epicentre of the earthquake – where one could see rubble clearance, evidence of rebuilding, people restoring family assets, and refurnishing their houses. There is definitely a commitment and steps being taken here to help rebuild lives. That said the process has been slow. 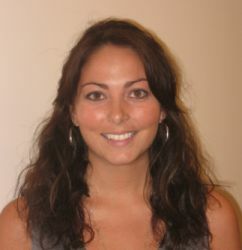 All of us would admit to that – all of us who work cooperatively within Haiti’s NGO community. Indeed after I finish writing this blog I will attend the weekly meeting of NGOs where we share what’s working, what’s not working, and what type of support we need. We ask ourselves what we can do collectively to improve the situation. I’m proud to say that since January 12, 2010, Save the Children has extended a lifeline to over 870,000 Haitians – more than half of them children. Today we continue to work with local partners, the Ministry of Education, the Ministry of Health, and others to bring basic services to the Haitian population. I believe in our work in Haiti. I believe we do make a difference. On Wednesday I visited the Eddie Pascal School – a school that was destroyed during the quake. Now children study in tents. In schools like these, where we provide assistance like teacher training, it is a delight to see Haiti’s children receive an education. And with all of the constraints that we face, I am pleased when I see one more child in school, and another child receiving quality medical care as well as lives being saved at one of our cholera treatment units. While seeing progress on a one-by-one basis may seem slow, it is precisely the kind of change that does make a difference. 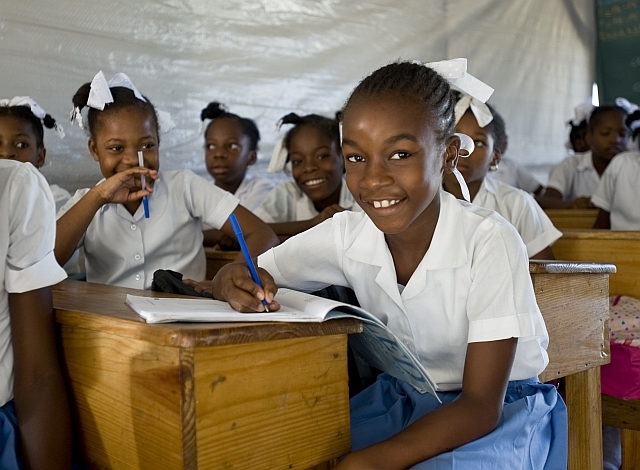 Rose, 10-years-old, attends a Save the Children school in Leogane. I’ve been in Haiti since December 20 to provide cover for staff enjoying the festive season with loved ones. On Christmas Day I had time to relax – for an afternoon at least – as we enjoyed a turkey lunch. Later we visited three of our cholera treatment units and gave cakes as gifts to our staff working around the clock to prevent the spread of the virus and to save lives. We wanted to show our appreciation. It was a nice thing to do. 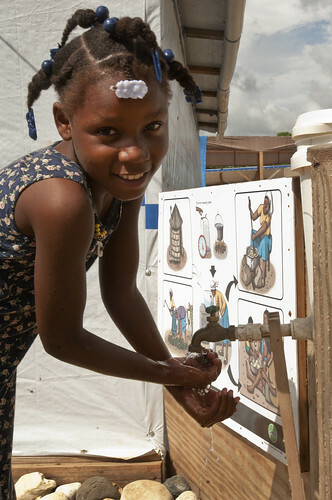 Angeline washes her hands to protect against cholera. Today I’ve been in a meeting of the health cluster including WHO – World Health Organization – since we have to prioritize where we are going to focus efforts on combating cholera. With so many cases of cholera now reported across Haiti it really is very important that we coordinate between all the agencies working on containing the cholera spread. It can take a lot of my time in coordination meetings but it is important to ensure we cover all the gaps. It now looks like the cholera outbreak will last at least another three months, especially in the mountainous regions of Haiti. We’re now working on how we can reach people in these remote areas – another reason why coordination of all the agencies is important. 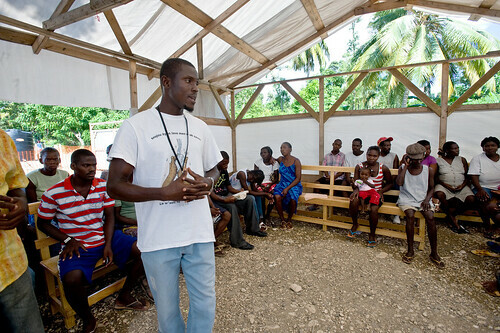 Hygiene promoter Arcliffe Laguerre leads a discussion on cholera prevention for residents of a Save the Children camp. Earlier today we had some great news. Medical supplies needed to combat cholera arrived from Europe. We’d been waiting on these supplies for a while. Due to the scale of the cholera crisis in Haiti they’d been in short supply. So it is good they have arrived. But first we must work with our loggies – logisticians – whose job it is to have the supplies clear customs as quickly as possible. Then we can work together to get the supplies to clinics to help people affected by cholera. Hopefully we will get the supplies out and into the clinics very soon. Moscow is known for its architecture, its ballet, and as the setting for “The Bourne Supremacy.” But this week, Moscow turned its attention to the world's babies and toddlers, when it hosted the first-ever global conference on Early Childhood Development and Education. More than 50 ministers of education, finance and health attended the UNESCO-sponsored event, designed to elevate the need for countries to invest in early learning opportunities globally, and to engage them in committing political will and resources to early childhood development programs. Research shows that children with early learning opportunities tend to do better in school and in life. According to a 2006 UNICEF report, more than 30 governments had established national early childhood development policies, and more than 70 countries had national commissions coordinating these programs. Yet, more than half of the world’s governments do not have any policy or mechanism in place for early childhood development. So you can see why there is a need to focus on early learning globally, beginning at infancy. Save the Children is here to share some of our learning and to learn from others, too. Early learning experiences matter for young children, especially in emergency situations, and social interactions are key. Young children interpret new experiences through interaction with caregivers. When governments are developing emergency preparedness and response plans (EPRP) as well as Disaster Risk Reduction plans (DRR), these plans should include an early childhood development component. In order for these plans to be effective, governments must provide guidance and training for caregivers and emergency responders on meeting the needs of children. Nepal, for example, has held education in emergencies training sessions that included an early childhood development component. The government also included early childhood development in its national emergency response policy, and it provided kits for use in safe and secure areas of emergency settings tailored to young children. Those kits contained games, stories, reading and play materials for babies and toddlers, as well as for school-aged children. 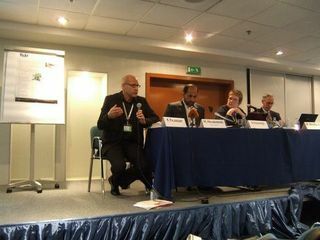 In emergencies, all sectors must be integrated to provide care for infants and toddlers, not just the education sector. In fact, health is also critical – and Water, Sanitation and Hygiene (WASH) elements in particular are important. 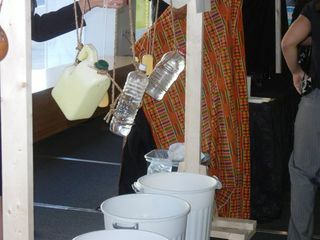 For example, families and caregivers need clean water to wash and sanitize toys. Two helpful resources for more information: Even in Chaos: Education in times of Emergency by Kevin M. Cahill, M.D. ; and a special section in the July/August 2010 issue of Child Development, which focuses on the developmental impact on young children after emergencies. The three-day conference ended today with the adoption of a framework of action, which outlines a number of challenges that must be tackled to achieve global Early Childhood Development and Education goals. These include addressing the need for greate r political commitment, public funding, and external support and effective delivery of services – a framework of goals that does not require a great super agent like Jason Bourne to tackle. Just committed governments and communities working together.